We arrived just after 13:00 at our destination in Corvara, App. La Flu – the stunning view from the balcony of the apartment set me in the right mood immediately and the Campolongo practically runs through the backyard. I went up the Campolongo, which I hadn’t climbed in 2011 from this side. As they are still working on the road, I had to get through some gravel-like patches, which in the first steep(er) section of the climb was not that easy. Moreover, upon starting my ride, it started to rain – not too bad at first, but it got a little worse after a while. As the climb is short, I had to start descending on a very wet and slippery road, with some treacherous cross winds to add to the fun. Not a very hopeful start, but once I got to Arraba and turned left towards Andraz, it all but stopped raining and it remained almost dry after that. In Andraz, I turned left again, to climb the Falzarego. 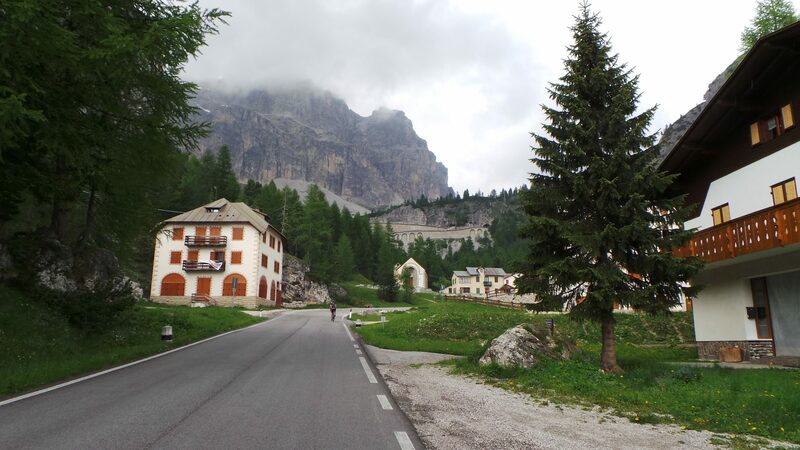 After a coffee at the top of the Falzarego, I went up the final 1.5 kilometers or so of the Valparola, descended towards La Villa and headed back to Corvara.